Jen and I were on patrol this evening about dusk thirty and saw some movement out back. Not a good enough visual to take a shot, but just to have a change of scenery, we moved the game camera around back. The back of my property is fairly dense. Woods and some rock ledges. Looks like we're going to have to get a bigger trap. As for Timmy, he's on his own. Update: Yeah, OK. So this was a hoax. Jen and I were in Bass Pro Shops last night and I shot this massive mountain lion mount inside the store. Then I decided I'd try to make it look like it came from my game cam. 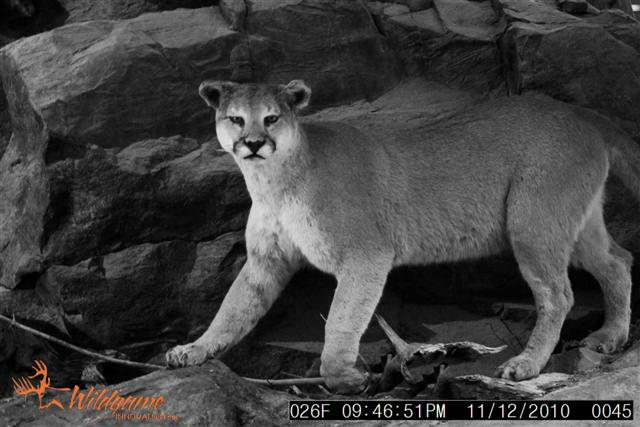 However, we do have mountain lions up here. I've seen them crossing the road less than a mile from the house. So, maybe I'll get a shot of a lion one day if I'm lucky.